Thanks! Great service, great prices and fast shipping. Highly recommended. Extra Heavy Duty Speaker Wall / Ceiling Mounting Bracket - 10kg + FREE SHIPPING! Ideal mounting solution for bookshelf or satellite surround-sound speakers! Let me get this out real quick before we begin: 10 kilogram weight capacity. *Phew* I’ve been busting to tell you that. This Extra Heavy Duty Speaker Wall / Ceiling Mounting Bracket means serious business. It doesn’t care if you’re using it for home theatre systems or your gaming computer. It doesn’t care if you’re mounting a satellite speaker on a 7.1 system or a bookshelf speaker in a more subdued 2.1 configuration. It only has one job to do, and it does it with a strength and precision usually reserved for helicopter gunships. Constructed of diecast metal, this is a great looking unit that will compliment most rooms. The serrated steel main axis can be pivoted and adjusted for the perfect angle, with a range of motion limited only by your speaker size. Even under the worst of conditions, your speakers will still be safe, protected from any fall by a braided steel wire lanyard. The speaker mounting plate has slot-style holes 9mm wide, spaced 65mm apart for compatibility with most sound system, pc or rear speaker types. When fully extended, you’ll have about 140mm of clearance between the wall bracket and the speaker plate, so double check your clearance when using this unit as a ceiling mount. Thank you for your email and for the opportunity to send some feedback, especially given that feedback is well deserved in this case. I only purchase products from the Internet only when necessary, due to the additional set of complications transactions over the Internet bring. However, I must say that without any reservation and by virtue of this personal experience, I am most impressed with your company. My case with this purchase is actually unique. I've had a need to purchase a monitor stand with great urgency for the Personal Assistant to the Head of the Middle School at my school. The school wasn't able to get the right one, let alone get it quickly enough. So, I went to numerous major computer stores/shops, as well as carry out an extensive search on-line. I even rang 2 interstate stores from their on-line websites to ask them for availability of the one I needed in silver (not black) and delivery times. Not only did they not have any at all in either black or silver, but I'd had to wait until the end of October (1.5 months) to get one! Now, exactly the same monitor stand I bought from you would have actually cost me substantially more from a bricks-and-mortar computer shop. So, not only have I saved -- in this case -- $50, but have saved an additional 33% off from your own prices! This is something that has to be experienced to be believed. Worried about the delivery time, I in fact rang your office to ask how quickly it would arrive, based on the direct cash deposit I made. I was advised 3-4 days for the transaction to be finalised and 2-3 days delivery; a total of up to 7 days. It actually arrived in 3 days, 2 of which were actually the weekend! In Summary: *On-line Website: Exceptionally easy to navigate. More so, what's on there is factual with no play on words. *Off-line Contact: A reliable person answered my call, who was more than accommodating and clearly explained what I needed. *Actual Product: I needed a specific stand of specific colour. From the web-based companies, yours was the only one who had it in stock and of the required colour. *Price: $50 cheaper from a bricks-and-mortar store and 33% less off from your own prices! *Transaction: A wide range of payment methods. Exceptional. *Delivery: I actually received it in less than half the estimated time! Perfectly packaged. *Delivery Cost: Far less than from any of the other websites I investigated. The monitor stand was mounted on time. The Personal Assistant's words: Hi Harris, I am LOVING this stand. I've so much free space now.- Julie-Anne. Again, if I'd not experienced it, I'd not have believed it. I'd certainly highly recommend your company to anyone and with unreserved confidence that any prospective customer will have the same unbelievable experience that I had in all of the above aspects. Many thanks again for actually making the purchase experience effortless, stress-free, and for the exceptional product together with its exceptional price. Kind Regards, Harris. This about the fifth time I have made a purchase with Cable Chick for my home and have been impressed every time by not only their price and prompt delivery but more importantly the willingness of the staff to go that extra step. I just purchased 2 speaker wall mounts but before I did had a couple of questions about the product, a simple phone call to Cable Chick and one of the staff members went down to get one out of a box to explain to me over the phone about the queries I had. I was very impressed and will and have always used them for my electronic needs. 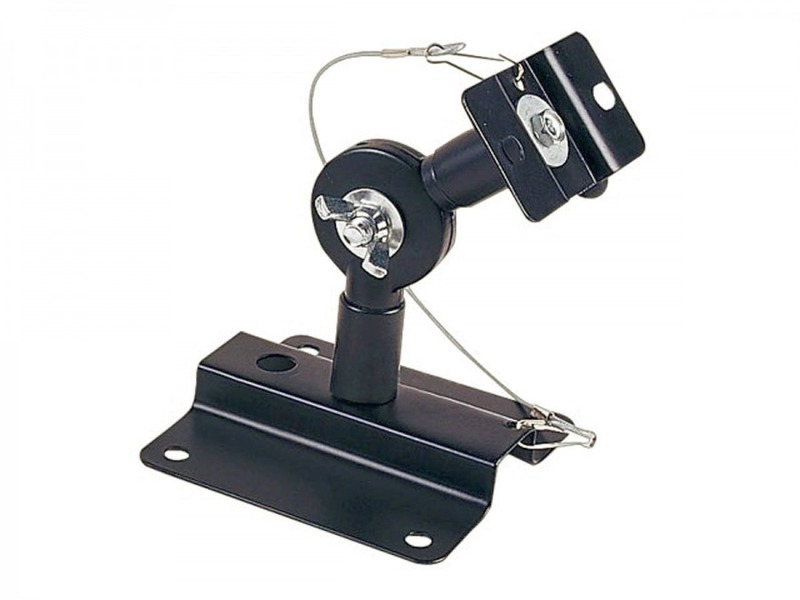 Answer: "The distance between the two plates (ceiling mount & speaker mount) is 140mm, when bracket is fully extended. ie: facing the floor (180 degrees) from the ceiling." Answer: "The holes are 65mm apart from the centre of each hole. The holes are elongated and 9mm in length which should allow some tolerance in fitting the speaker to the plate." Answer: "Two bolt holes on the smaller of the two plates visible in the photo can be matched with pre-existing bolt holes in your speakers, or wooden speaker cabinets can be drilled to match." Answer: "It's sold as a single bracket." I am very happy to provide you with feedback. The items were perfect, the service was perfect what else could I say. Please be assured that I will tell all about your business.